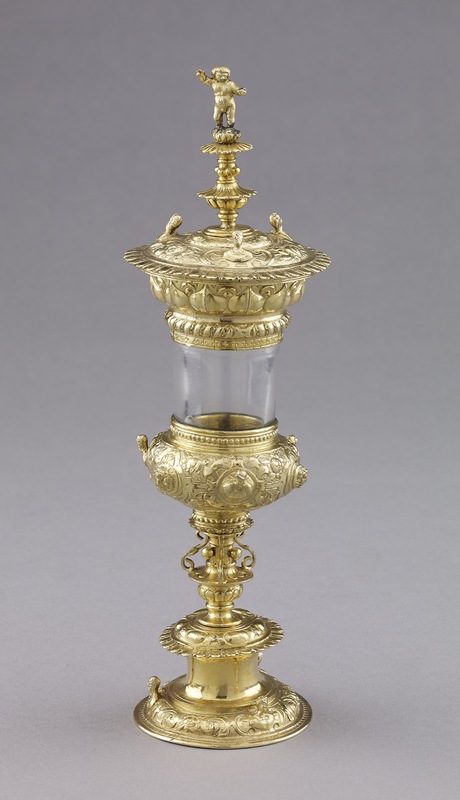 Miniature standing cup and cover; body of rock crystal cylinder, mounted in silver-gilt; embossed and chased; lip embossed with petal-shaped lobes; base with three busts in full relief alternating with masks within frames surrounded by trophies of fruit; baluster stem with S-shaped brackets; three busts in full relief on foot; cover similar, mounted with figure of little boy. This object was previously owned by Robert Fitzroy, collected by Anselm von Rothschild and bequeathed to the British Museum by Ferdinand Anselm Rothschild. Origin: Uncertain; no silver punch-marks; previously attributed to a South German workshop about 1580, but more probably from a minor North German or Baltic centre, during first quarter of 17th century (with later additions). Provenance: Baron Anselm von Rothschild, Vienna, before 1866. NB: This differs from the previously published account (see below). Commentary: In Read 1902 it was stated that this object had come “from the collection of Admiral Sir Robert Fitzroy, K.C.B. (1896)”. However, this statement now appears to be incorrect. The Order of the Bath (K.C.B. Military) had been conferred on Vice-Admiral Robert O'Brien Fitzroy on 25 May 1895 and the sale of his collection took place at Christie's on 10 December 1896, but a thorough search has revealed only one lot in which any rock-crystal objects are mentioned. This entry (lot 139) is quoted in full in a discussion of WB.124 because that piece, too, is stated in Read 1902 to have the same Fitzroy (1896) provenance. As can be seen, the Christie's Sale Catalogue brief description of lot 139 does not provide any secure grounds for linking this standing-cup and cover with the sale of Admiral Sir Robert Fitzroy's collection in 1896. The one detail that differs significantly is the description of the cylinder as being composed of glass - not rock-crystal. Being particularly clear and free of flaws, it may have been assumed that it was correct to regard it as a very fine and early achievement in glass-making. On the other hand it may have been acquired primarily for its unusual merits as a piece of silver, and consequently if it was thought to be a glass replacement for the original rock-crystal, then it might not have mattered. Of the two possible explanations the last seems the less probable, for Baron Anselm had the reputation in Vienna for being a most fastidious collector, for whom only the highest standards of excellence were normally relevant. The chances of Baron Ferdinand in England being able to acquire an almost identical piece - but made with rock-crystal - and yet having the same dimensions and numerous identical details, are so remote that they may be dismissed. For some reason the wrong provenance seems to have been recorded in Read 1902, and subsequently was neither checked nor corrected. The absence of punch-marks makes the identification of the origin and date of this object problematical, especially as the original stem and finial (on the cover) appears to have been lost - see the detailed description of the object and its condition. Apart from the markedly inferior workmanship of these two elements, the unparalleled use of three very crudely formed scroll brackets, each with a pair of curiously atypical lobes emerging on either side at the centre, and the equally unparalleled use of horizontally projecting spherical 'toadstools' on both the stem and the finial, are disturbing features that destroy the unity of the object and therefore have to be reassessed. If the stem and the finial are part of a later restoration of the covered standing-cup, then the original may, indeed, have been more akin to the well-known type of tall, slender, German standing-cup and cover of the late sixteenth and early seventeenth centuries that is so well represented in the historic collection of the Moscow Kremlin - for example, the 1596 covered cup by Hermann Bordesloe of Hamburg (active 1579-1613), which was presented by the Cathedral Chapter of Lund to Christian IV on the occasion of his coronation as King of Denmark in 1596. It was then sold in 1628 in Archangel, together with other silver plate from the Danish Royal Collection, and entered the Tsar Michael Romanov's Treasury (inv. no. MZ - 396/1-2; see M. Bencard and G. A. Markova, ‘Christian IV's Royal Plate’, Rosenborg, 1988, pp. 17-18, cat. no. 6, fig. 5; see also G. A. Markowa, ‘Deutsche Silberkunst des XVI-XVIII jahrh, in der Rüstkammer des Moskauer Kreml’, Moscow, 1975, no. 17 with col. pl.). This famous presentation gift (H. 91 cm) is the work of a leading Hamburg goldsmith, who seems to have been influenced by South German artists, as discussed in Bencard (1988). Its form and various decorative elements, such as the two sets of three small busts (executed in the round) decorating the lower part of the cup, were also usefully discussed and illustrated in 1986, alongside photographs of two original designs from the prosperous and large Hamburg workshop established by the goldsmith Jacob Mores the Elder (master in 1579); both drawings depict standing covered cups (including one mounted coconut cup) featuring prominently these high projecting busts, both on the cover and on the foot (see J. I. Smirnowa and B. Heitman, ‘Gold und Silver aus dem Moskauer Kreml: Meisterwerke Hamburger Goldschmiedekunst’, Museum für Kunst und Gewerbe, Hamburg, 1986, pp. 42-8). The Moscow Kremlin also possesses a fine example of this three-dimensional sculptural motif from the Nuremberg workshop of Hans Petzolt (master in 1578, died in 1633); it is a tall cup that the Swedish King Karl XI presented to the Tsar in 1684 (Markowa 1975, no. 23, with col. pl. ; F. Martin, ‘Schwedische königliche Geschenke an Russische Zaren’, Stockholm, 1900, p. 38, pls 37-8). Two further examples preserved in the Moscow Kremlin illustrate the extremes to which this fashion for sculptured heads in the round could be taken by German workshops in the early seventeenth century; the one from Passau is the more audacious, but the anonymous tall covered cup, first documented in 1642, is the more closely related, albeit on a much grander scale and more accomplished level (see Markowa 1975, nos 28-9, with col. pl.). A study of these reliably documented examples in the Kremlin confirms the doubts already expressed about the stem and the finial on the Waddesdon Bequest miniature rock-crystal covered cup. Therefore an alternative possibility is that this covered cup's overall height was originally even less than at present and that it was made to join a travelling set, where it would have been kept in its own compartment within some magnificent case - like the famous silver and mother-of-pearl travelling casket in the Grünes Gewölbe, Dresden, by Elias Geyer of Leipzig (master in 1589, died in 1634), which houses a miniature coconut cup and cover (H. 21.5 cm) with elegant silver-gilt mounts, incorporating a Venus and Dolphin group in the stem. The entire travelling case was acquired for the Elector of Saxony's Kunstkammer in 1602 (inv. no. III, 247; see Joachim Menzhausen, ‘Das Grünes Gewölbe’, Leipzig, 1968, p. 81, pl. 43; also R. Fritz, ‘Die Gefässe aus Kokosnuss in Mitteleuropa, 1250-1800’ (Mainz, 1983, p. 118, no. 183, pl. 97a). It typifies the late Renaissance German Court taste for virtuosity on this miniature scale. Hugh Tait, 'Catalogue of the Waddesdon Bequest in the British Museum. II. The Curiosities', British Museum, London, 1991, no.44, figs. 374-376.